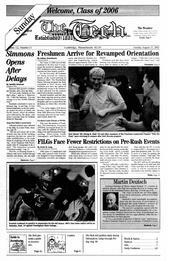 Simmons Hall opened to residents last Tuesday, after a four-day delay. Residents scheduled to move in between Aug. 16 and Aug. 19 were housed temporarily in the new graduate student dormitory at Sidney and Pacific Streets. About 60 students were affected by the delay, said Senior Associate Dean for Students Robert M. Randolph. Affected residents were informed of the delay by e-mail Friday morning, Aug. 16. “We do not know all of the details, but one of the building inspectors, the last one, asked for some modifications to be made before he would sign off on the building,” wrote Simmons Hall Housemaster John M. Essigmann in the e-mail. “The inspection occurred [Thursday] evening,” Aug. 15. Director of Housing Karen A. Nilsson said crews worked through Saturday and Sunday, day and night to complete a host of tasks in preparation for the arrival of the new residents. Jobs done included electrical work, plumbing, putting up shower curtains, and custodial work, she said. Randolph also said some work needed to be done on the ventilation in the atria. Since June, construction crews have been working longer shifts and weekends in an attempt to get the building complete by the time students with early returns started to arrive, Nilsson said. “We had hoped to be ready by [Aug. 16],” Randolph said. “Whenever you get ready to open a building, there are always a few last-minute things” to be done, Nilsson said. Dean for Student Life Larry G. Benedict said the Institute obtained the necessary permits on Tuesday morning at 8:30, and residents started moving at 10:00 a.m. While many students are now settled in at Simmons Hall, some furniture still had not arrived at the building as of Friday night. “All the important furniture is there,” Benedict said. Benedict said the desk chairs, as well as the tubs for some storage units, were “in a warehouse in New Hampshire” on their way here Friday afternoon. Meanwhile, residents are using folding chairs, he said. Much work still remains to be done on the building. The dining hall, for example, is part of Phase II of the project, slated to be complete in late October or November, Nilsson said. By September, Simmons will house about 350 undergraduates. Nilsson said the beds were evenly distributed among the four classes.